how and when was anonymous Tunisia founded? anonymous Tunisia is not an organization, there is no date for it ,when it was founded, so its a part of anonymous movement,It Was more famous at The Revolution in 2011.
so how many members are presently in anonymous Tunisia? 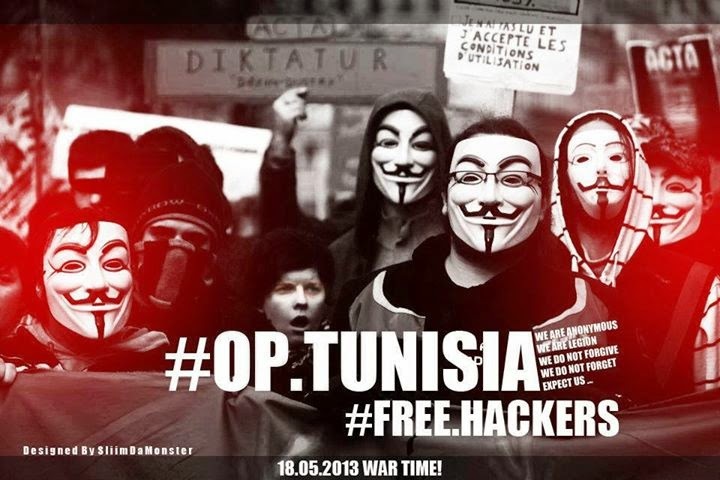 how anonymous Tunisia works?i mean do you hack for other causes too or just for tunisia? is anonymous Tunisia against Tunisian government? and what are your main targets? how many operation you guys have operated till yet? so what was the cause of operation Tunisia ? Against internet censorship? why is anonymous TUNISIA against their government? op Tunisia was launched because of the lack of freedom the people had before the revolution.. The Anonymous group has criticized the Tunisian Agency for Technical Electronic Communications created by the Interior Minister, Lotfi Ben Jeddou. Anonymous Tunisia has advised that the arrest of hackers who participated in the attack is a violation of freedom. what major problems you guys have with your gov. they try to take away our freedom..
to act and think the way they want us to..
they try to take away every freedom we got left and fought so hard for..
so what resource you use to target your gov. since they are trying to watch us..we are watching them back and leak data for the public to see what they are really up too..
is there upcoming operation of anonymous TUNISIA ? okay,what message you want give to your government and other your Targets? our message:that they can not stop us…and that we will never give up..no matter what they do or how they do it..we will always fight for the cause. did you got any threat via any agency or government? who got arrested and what for reason? thanks a lot for the interview with us,this is the story of anonymous Tunisia.